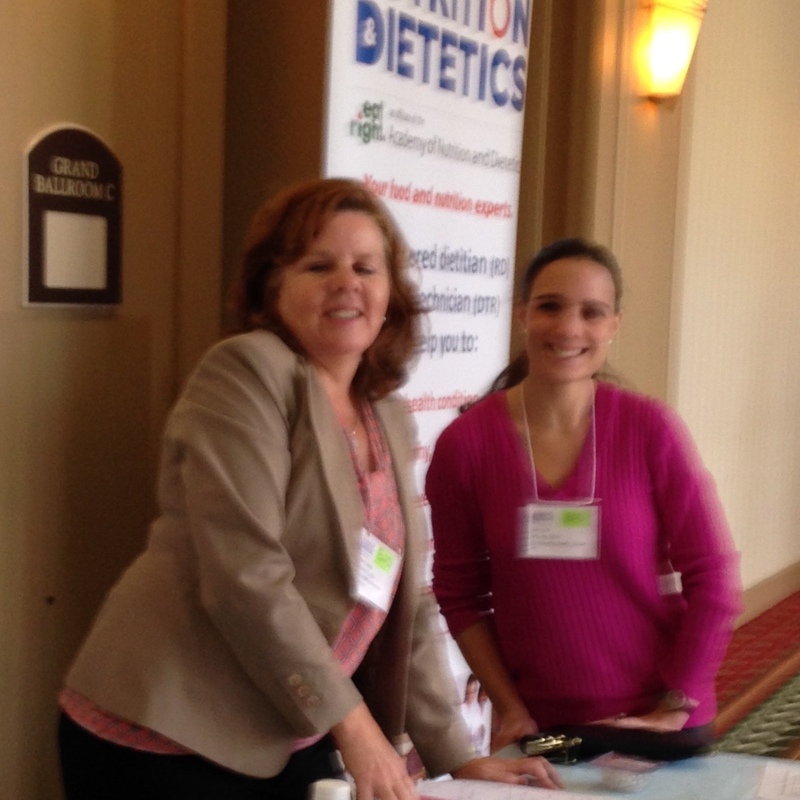 The Connecticut Academy of Nutrition and Dietetics is the advocate of the dietetics profession serving the public through the promotion of optimal nutrition, health and well-being. Our members are the most valued source of food and nutrition services, providing credible nutrition information to the state of CT. The nutrition profession requires staying up-to-date and current in science and practice. 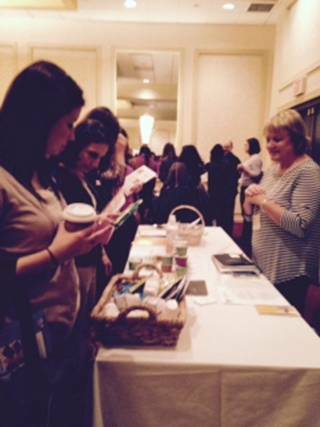 So on Nov. 14th, 2000 CT Registered Dietitian Nutritionists, Dietetic Technicians, Registered, and students attended the Fall meeting of the Connecticut Academy at CoCo Key Water Resort Hotel and Convention Center in Waterbury. There were a wide variety of exhibitors including End Hunger CT, Lilly USA, New England Dairy Council, Cambridge Eating Disorder Center, Sunbutter, Stativa Pharmaeuticals (Megace), Monsanto, Miai Yogurt- Registration Samples, Simplified Nutrition, Medtrition, Nestle Health Science, TFC Health Foods, Skinnygirl Tasty Nutrition Bars and Skinnygirl Sparklers. Jim Painter, PhD, RD, Director of Nutrition Research, California Raisin Marketing Board will show the factors that contribute to most people not being aware of their volume of food consumption. He presented some fun techniques for dietitians to use with their clients to help them be aware of their eating pattern, reduce excess calories and make healthier choices. Rafael Perez-Escamilla, PhD, Professor of Epidemiology & Public Health, Director of the Office of Public Health Practice, and Director of the Global Health Concentration at the Yale School of Public Health provided a background on the Dietary Guidelines for Americans. He addressed what changes might be in the 2015 Dietary Guidelines – including new recommendations for children under two. Christine Rivera, RD, Nutrition Manager of Feeding America, led a panel on the state of food insecurity in Connecticut. She was joined by Lucy Nolan, JD, Executive Director of End Hunger CT!, Judy Prager, RDN, CDN, Hunger Study Coordinator, CT Food Bank, and Trish Molloy, RD, School Food Service Director, West Hartford Public Schools. Nancy Rodriquez, PhD, RD, CSSD, FACSM, Professor of Nutritional Science, University of Connecticut. Dr. Rodriguez focused on relationships between exercise, protein intake, and protein utilization in athletes, physically active adults, and children. Nancy Ryan, MS, RD, BC-ADM, CDE, CDN Nutrition Consultant and Diabetes Educator presented the latest on helping patients achieve diabetes management goals using productive and positive approaches. Barbara Bush and Gail Cole welcome the attendees. Lots of activity at the exhibits. I recently attended the Academy of Nutrition and Dietetics Food and Nutrition Conference and Expo (FNCE), the world’s largest annual meeting of food and nutrition professionals. More than 8,000 registered dietitians, nutrition researchers, policy makers, health care providers and industry leaders attend this four-day event. Each day is packed with research, educational presentations, lectures, debates, panel discussions and culinary demonstrations. This year, the Expo portion of the event draws more than 350 food- and nutrition-related exhibitors. It’s here that new products and innovations are launched and food trends come to life. Most of us struggle to get enough vegetables in our diet, so food manufacturers are helping us by featuring them in some delish sweet treats or by packaging them in portable squeeze containers. The popularity of plant-based eating has encouraged manufactures to make products with plant-based proteins. Pea protein is a hot protein alternative to egg and dairy protein because of its link to greater satiety compared to whey and other proteins, and it is easy on the stomach and almost completely digestible, making it the perfect choice for sensitive individuals, children and the elderly. Perhaps the most striking health benefit provided by quinoa is its overall nutrient richness. When the nutrient composition of this food is analyzed in depth, the results are unusual and striking. While quinoa can be eaten in the same way as a grain, it provides a good source of protein, about 8 grams per ½ cup. Chia and hemp seeds are gaining popularity due to their heart-smart omega-3 fatty acids. No doubt, obesity was a dominant topic throughout the conference, so ways to address the problem were top of mind. Bars are popular. You can take them anywhere and they do not require refrigeration. Before you reach for a bar, think about what this is fulfilling because nowadays bars are customized to your needs and lifestyle, meaning they are not all created equal. An essential tip is to look at ingredients, and choose one that you can pronounce each ingredient. Kefir is a cultured milk product that is similar in taste and texture to drinkable yogurt. This creamy, tangy drink is made by adding kefir grains to milk, which leads to fermentation. Kefir grains are protein-based clusters containing probiotic cultures, proteins, fermenting agents, and lactic acid. Kefir contains Lactobacillus Caucasus, Leuconostoc, Acetobacter species, and Streptococcus species, as well as some beneficial yeasts that aren’t found in yogurt. Fermentation, bacteria and yeasts might sound unappealing, but this is what makes Kefir good for you! We have both good and bad bacteria in our gut. Probiotics are friendly organisms that restore balance of the good and bad bacteria in the digestive system. Research suggests probiotics can help with diarrhea caused by antibiotics, as well as excezma and immunity. Some brands of kefir also contain prebiotics, like inulin, which feeds the probiotics and enhances their population in the gut. Kefir comes in plain, non-fat, low-fat and a variety of flavors like strawberry, blueberry, pomegranate and vanilla. All varieties will offer up probiotics, which makes the product popular with individuals suffering from gastrointestinal problems like constipation, diarrhea, bloating, and gas. Even those who are lactose intolerant can usually tolerate kefir because the live cultures “predigest” the lactose. It has been suggested that probiotics may even aid in cancer risk reduction, and weight control- but evidence is less conclusive at this time. You may see probiotics sold in the form of supplement pills, but consuming them in the form of kefir will come along with a number of other nutrients too. The protein content (8-11g per 8oz) can help with satiety, and you’ll also get a good source of Vitamin A (10% DV), Vitamin D (25% DV), and Calcium (30% DV) – based on a 2000 calorie a day diet. Just be careful not to over do it on the flavors with added sugars. Kefir can be drank alone, blended with fruit in a smoothie, poured over cereal, or used instead of buttermilk in recipes, like soups and baked goods. Some companies even produce frozen kefir as a dessert. The frozen probiotics defrost in the warmth of your internal body temperature, causing them to become live again once in the gut. Recipe: Try the recipe below for a healthy start to your morning! Blend all ingredients in a blender. Add a splash of milk of choice if a thinner texture is preferred. After the awareness, comes action! February is American Heart Month and Friday, Feb 2nd, is GO RED for women day. Heart disease is the No. 1 killer of women, taking more lives than all forms of cancer combined. But we have the power to save lives – our own, our mother’s, daughter’s and friend’s what better time to take action to reduce your risk factors for developing heart disease. Still not sure if you are at risk? Visit the website:www.goredforwomen.org use the online risk assessment tool. Schedule an annual physical and checkups for any medical problems. Know your blood pressure, cholesterol and blood sugar numbers. With your doctor’s approval, get at least 30 minutes of moderate physical activity (exercise) each day. Know your community resources and try a variety of activities. Everything counts! It doesn’t have to be 30 continuous minutes. Take prescribed medications as directed. Ask questions about side effects and how long you will need to take. If you smoke, quit now. Seek online or community resources to help. Change how and what you eat. Use the resources above for shopping and cooking tips and www.eatright.org to find a Registered Dietitian. Don’t Get Stuffed This Thanksgiving! Have a light snack a few hours before your Thanksgiving feast so you’re not famished when it’s time to eat. Scan the buffet table or dining table to see what’s on the menu and focus on your favorites. Take small portions of your favorites, but don’t overdo it. Watch your portion sizes. A 3-ounce serving of turkey is about the size of the palm of your hand or a deck of cards. A serving size of veggies is ½ cup. Eat your Thanksgiving meal on a luncheon plate versus a dinner plate and your likely to fill your plate with less food. Eat slowly and drink sips of water between bites. Stop eating when you’ve eaten about half the foods on your plate. Then ask yourself if you’re still hungry. If you’re still hungry, eat a bit more and then stop again. It takes at least 20 minutes for your stomach to signal your brain that you’re full. Load up on veggies and go easy on higher fat items like stuffing, casseroles, gravy and butter/margarine. Avoid taking seconds. Save your extra calories for dessert. Avoid drinking too much alcohol. Alcohol is metabolized more like fat in your body and provides “empty calories” which means it provides mainly calories with little nutritional value. A 5-oz. glass of red or white table wine contains about 120 calories, 12 ounces of beer contains on average 150 calories, 12 ounces of light beer contains 100 calories. Sample small portions of your favorite desserts. Take some home in a doggy bag if you’re full.